As training theory continues to evolve, coaches and exercise scientists are continuing to uncover more effective and efficient ways to train and get results at long distance racing. In particular, coaches now understand the importance of speed development (recruiting maximum muscle fibers per stride, developing neuromuscular coordination, and improving efficiency) – even for long distance runners, who race at paces far slower than their top-end speed. In fact, if you’re a runner who focuses on the half marathon and marathon distance, speed development is even more important than you may realize. Most marathoners devote a vast majority of their training to logging lots of miles and threshold runs, which, I won’t argue, is critical to running your best during that training segment. As a result, most marathoners may go years without running faster than 5k pace. Consequently, they lose their ability to generate explosive muscle power, running efficiency and economy declines, and form starts to breakdown. This loss of speed is even more pronounced with age since studies show speed is the first ability to deteriorate as you get older. Therefore, for long-term progress, it’s important you incorporate speed development work in your training. In this article, we’ll explain the difference between speed development and speed work and show you how, and when, to implement speed development work into your schedule. It may seem like semantics, but there is a difference between speed development and speed work (which is what runners traditionally think of when envisioning speed). While some coaches and publications use the terms interchangeably, understanding the difference between the two is important to appreciating how speed development workouts will benefit you, especially because they are rather unconventional workouts for a distance runner. Speed development is training your top-end speed, i.e. the absolute fastest pace you can run, which usually tops out running less than 100 meters. For example, most Olympic caliber sprinters reach their top speed at around 50-60 meters (Usain Bolt reached his top speed at 60-80 meters during his World Record run). During speed development workouts, you’re not concerned with improving your metabolic energy systems (VO2 max, lactate threshold, aerobic capacity); rather, the focus is increasing the maximum amount of fast-twitch muscle fibers recruited for each stride and improving the speed at which your brain sends signals to your muscles to fire (the neuromuscular system). On the other hand, traditional speed work, what runner’s think of as 400 meter or mile repeats, is about improving VO2max or anaerobic threshold. While you certainly recruit a greater percentage of fast-twitch muscle fibers during a set of 400 repeats compared to a long run, it’s not the purpose of the workout. Speed work is, and should be, primarily focused on improving metabolic systems. Understanding this difference is important, especially when you’re performing speed development workouts. Traditional speed workouts are quite challenging because you’re running fast with minimal rest. Your lungs are often burning and you’re fighting hard to finish each interval. Again, this is because the goal is to improve your VO2max. On the contrary, speed development workouts are alactic, which means you do not need oxygen for energy and don’t produce lactic acid when running them. Consequently, speed development workouts won’t have you panting or clutching your knees after each interval because they are only 50-150m long. Moreover, you will also have a complete and full recovery between each repeat. To recruit maximum fast-twitch muscle fibers, you must be fully recovered before each interval. Now that you understand the difference between speed work and speed development, how does speed development make you a better marathoner? After all, you won’t be racing Usain Bolt anytime soon. 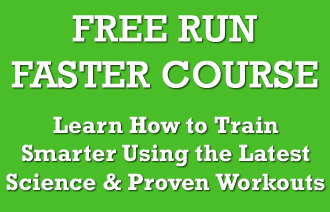 It all boils down to being able to improve your running economy and efficiency. In layman’s terms, you can run faster and farther with less effort and while expending less energy. For a marathoner or half marathon, this means race pace will require less effort (making it feel easier, especially in the latter miles) and conserve precious carbohydrates. As discussed earlier, speed development workouts train the body to activate a greater percentage of muscle fibers with each stride. In doing so, you’re able to make each stride more explosive and generate more power without increasing effort. This increased power is what makes your stride more fluid and allows you to propel yourself farther with each stride – basically making you faster. In addition, speed development improves the efficiency of the neuromuscular system, which is the communication system between your brain and your muscles. Improving the neuromuscular system allows your body to increase the speed at which it sends signals to the muscles and, more importantly, contributes to the activation of a greater percentage of muscle fibers. Speed development work is a complementary training element and isn’t something that should compose a majority of your training schedule. Instead, it should be an infrequent, ongoing component of training or a dedicated, short speed development phases in the yearly training schedule. It’s imperative that you have no existing injuries and have done some core or basic strengthening work before starting speed development workouts. Running at top end speed is demanding and, in some cases, challenges muscles that you may not have used in years. If you’re unsure about your body’s ability to handle sprint work, start with core workouts and explosive hill sprints for three weeks. After three weeks you will be ready for more intense speed development work. One method I like to use to incorporate speed development work is to schedule a speed development workout every 12-14 days, year-round. In doing so, you never get too far away from your top end speed and you can continuously improve as your training progresses. At first, speed development workouts will take the place of your normal workout day (preferably replacing a speed work or hill session). After your muscles get well conditioned to speed development workouts, we can do them the day before a VO2max session or a lighter threshold run. The downside to incorporating speed development this way is that you potentially sacrifice a race-specific workout every 12-14 days. If you race often or you are a beginner runner, this may make it difficult to get in all the longer tempo runs you need to race well in that particular training segment. So, we may incorporate speed development in another way. Another approach is to dedicate a specific 4-6 week training block to speed development. This is my preferred approach, especially if you’re a marathoner who wants to race a spring and a fall marathon. After you recover from the marathon, you should begin a speed development phase, which is a good way to ensure you’re working on all your energy systems and changing up the stimulus between races, before jumping back into marathon training. The negative to the speed development phase is that you won’t be able to race very fast during this 4-6 week block. Your training will consist primarily of sprint work and you won’t be doing race-specific workouts or lots of tempo runs, so your race-specific fitness won’t be as high as it will be when fully focused on one event. If you’re not the type of runner who can see the forest through the trees, this might be difficult mentally, but hopefully we can work through it together. This is a session that works well if we’re doing speed development throughout your training cycle in place of another workout. While the 150m and 200m repeats aren’t technically alactic, they will help you improve your ability to relax while running fast. The 50m repeats are definitely alactic and are the real speed development portion of this workout. I’ve added the 2 miles at 10k pace at the end to add a little tempo effort and keep the workout at a reasonable mileage level. This session is definitely a fun change of pace in the middle of marathon training if done once every two weeks. This workout structure was popularized by Jay Johnson and is a true speed development session. The first part of the 150m is to get you up to speed and helps prevent injuries. The later half of the workout maximizes muscle fiber recruitment and explosive speed. Hopefully, this article provided insight into why you’re doing speed development training and how it will eventually help your training in the long-term. Remember, don’t skimp on the rest and developing top end speed takes time, especially if you’ve never done it before. Be patient! Ah! Great read and helps to guide me through these next few weeks!! Hi! Is Workout 2 for Speed Development Phases? If so, how many days per week (for 4 to 6 weeks) should Workout 2 be performed?